Marion-Sterling School teachers participate in the "thumb ball" activity as part of trauma-informed teaching training through FrontLine Services. Cleveland’s Central neighborhood has the second highest rate of aggravated assaults and the fifth highest rate of reported domestic violence incidents in the city. Children witnessing or being a victim of violence is not uncommon in Central and can have lasting impacts on children and their ability to go to school ready and prepared to learn. A traumatic event can significantly interrupt the school routine and the processes of teaching and learning. This is why Cleveland Central Promise Neighborhood decided to partner with Frontline Services to offer trauma training in two Cleveland Metropolitan School District schools in the Central neighborhood. In the coming months teachers at Marion-Sterling and Alfred A. Benesch Schools will receive six hours of training that will cover the psychological and physiological effects trauma has on children and classroom strategies for helping students overcome barriers to learning. Richaun Bunton, education performance manager at Cleveland Central Promise Neighborhood, said teachers and schools feel the impact of violent incidents that happen weekly in the neighborhood. Students who grow up in Central often face more challenges than those in other areas. The child poverty rate (81.2 percent) is higher than any other neighborhood in Cleveland, according to Center for Community Solutions. Children there are also more likely than others to be exposed to gun violence, sexual violence and, most often, domestic violence. Frontline is a local outreach agency that specializes in behavioral health, homelessness and trauma. They spent an hour with the Marion-Sterling teaching staff discussing the effects that violence can have on children’s mental health and academic performance and what teachers can do in their classrooms to alleviate some of the symptoms that make it harder for the children to learn. Rosemary Creeden, a licensed social worker and the associate director of trauma programs at FrontLine, is one of the three trainers working with CMSD teachers. These behaviors include difficulty focusing, increased anxiety, restlessness, irritability and withdrawal, among others, Creeden said. Students might also come to school feeling very tired because they had difficulty sleeping. “When we read about shootings in the news, we have to remember there are children who live in those neighborhoods who hear those gunshots, and the people being hurt in these gun exchanges are people they know,” she said. Many CMSD teachers are keenly aware of what their students go through. Lakesha Boyd, first-grade teacher at Marion-Sterling, said she sees the effects that Creeden described almost every day in her classroom. Last year, one of Boyd’s students had a family member who was shot to death, and Boyd noticed a major shift in the girl’s behavior. The girl experienced emotional highs and lows and seemed to suddenly be attached at Boyd’s hip. Boyd attended the first training and is hopeful that she’ll learn strategies to help her students. While most of the first training focused on informing teachers about how trauma affects students, Creeden and her colleagues also took some time to go over some helpful classroom activities. Some activities centered around mindfulness in the classroom, like chair yoga and breathing exercises. 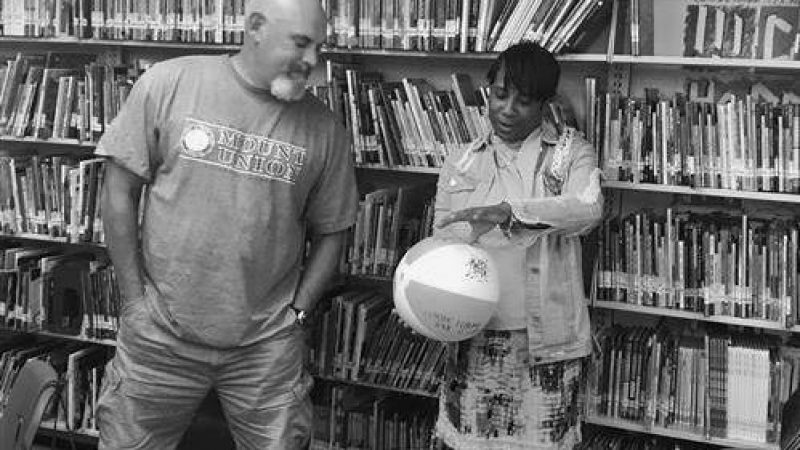 Another, called “thumb ball,” involves writing fun or academic questions on a beach ball. The participants gather in a circle and throw the ball. Whoever catches it must answer the question that his or her thumb lands on. It’s a way to promote movement and help children relieve stress. The next sessions will delve further into classroom techniques and how teachers can build resiliency in both students and themselves. Boyd, the first-grade teacher, has been following some of the news around neighborhood crime and is keeping it in mind as she welcomes her students back from summer break. She is glad she found a use for the bag of beach balls she brought to her classroom over the summer. The “thumb ball” activity, she said, might be a good way to break the ice. Cleveland’s News Channel 5 WEWS-TV recently highlighted the partnership between Promise Neighborhood, Frontline and Cleveland Metropolitan School District. Watch the story here. The Cleveland Metropolitan School District News Bureau also highlighted the program. Read more here.